In typical spring fashion, I have been trying to balance an insane social schedule with an attempt to maintain/improve my physical health. Early morning sleep-in sessions have gradually been replaced with some personal training and boot camp sessions, and any evenings I skip the usual glass of wine help the cause, too. I have a beach trip coming up at the end of the month (Congrats, Meg! Can't wait to celebrate with you!) so I have been hitting the pavement once or twice a week for a run, too, to make sure my body looks bikini-ready. On top of all of that is the never-ending struggle to eat healthy, well-rounded meals. I have skipped out on official food tracking of late, but have been trying to keep the health mentality in mind when selecting foods and meals to make during each week. While I am a coupon-clipper amateur, I do pride myself in finding great ways to stretch my weekly food budget, which varies from $30 up to $80 depending on how many meals we are eating at home that week. 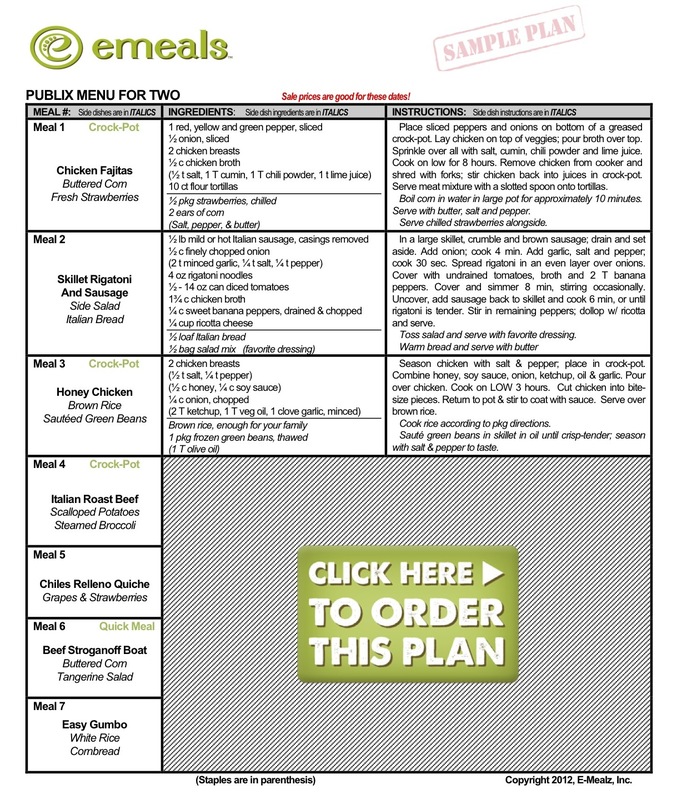 So you can imagine my glee when eMeals reached out to me to test drive their meal-planning system! with a detailed list to use at the grocery store. ingredients into each menu plan. I got to select my meal plan of choice, which gives you options for different large grocery stores as well as nutrition level and family size. Plus it shoots out the weekly coupon and BOGO specials along with an expected budget total. Publix Meals for Two meal plan, here we come! We have busy weeks with a few evenings of night school for the S.O. and usually a few nights out for yours truly. So I usually shoot to cook at least four meals at home per week. That gives us enough food for lunches and some to enjoy on leftover nights, and if we are in a bind, I usually have something in the freezer, too. This week, we are low on everything (including freezer meals) and plan to eat at home more than last week, so it's restock time! I used my seven-day printable list from eMeals to pick out my favorite five meals for this week to pick up at the store. I just crossed of the items/meals I didn't need. The meals look really tasty, and include well-rounded sides like salads and veggies. It has some great variety (I hate getting into cooking ruts). The shopping list was supposed to cost around $60 pre-tax if I stuck to it exactly. I skipped about $10 items' worth, but then got an additional $35 of re-stock staples like cereal, salad dressing, paper towels and a Publix sub (ok, not a staple, but it was lunchtime!). I am pretty impressed with the amount of food I brought home for $90 including all that extra stuff. All of the prices were dead-on, and it was really easy to follow the list and pick out exactly what I needed. I can't wait to have these five meals this week! Are you interested in eMeals for yourself? Well, you are in luck! eMeals is graciously giving away a three-month subscription to one of my readers! Use the Rafflecopter widget below to quickly and easily enter. And don't forget that you can also check out the eMeals blog for recipes, tips on how to simplify your life, organize your days and plan family fun. Are you ready to win and save money on your weekly shopping trips?! Best of luck!! Disclosure: eMeals partnered with bloggers such as me to help promote their meal subscription services. I received a meal plan test account from eMeals in exchange for this promotion. This post contains affiliate links. The winner of the giveaway in this program will be randomly chosen and gift card fulfillment will be handled by a third party. My sister uses emeals and LOVES it! I've heard about it on Dave Ramsey before & always been curious to see how it works. I have been thinking about using emeals for a little while. This would be great! My first BBoaB mention!! Can't wait to see you soon!